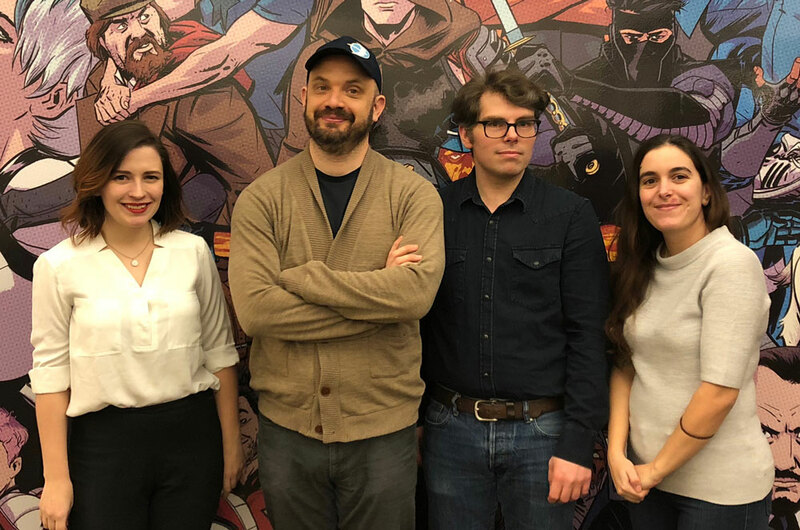 New York, NY (April 4, 2018) – Thanks to its continued success as an innovative publisher with an expansive slate of award-winning titles, Valiant Entertainment is proud to announce the advancement of four staff members: Atom! Freeman has been named to the position of Vice President of Sales, Peter Stern is Director of International Publishing & Merchandising, Victoria McNally is Senior Marketing & Communications Manager, and Annie Rosa is Sales Operations Manager. Atom! Freeman began his career in comics managing Brave New World Comics in Santa Clarita, California. 25 years later, he has since owned Brave New World, was the recipient of the 2008 Will Eisner Spirit of Comics Retailer Award, was nominated for the ComicsPRO Industry Appreciation Award, and worked for publishers as varied as Fantagraphics Books, Top Cow Productions, and Valiant Entertainment. In 2011, he began his time at Valiant calling comics retailers, letting them know that the new company was about to begin publishing and asking for feedback. He has since been instrumental in building the largest sales team in the comics industry with the most aggressive tools and strategies for retailers to maximize their sales on Valiant books. In Peter Stern’s new role, he will work on Valiant’s collected and digital editions programs, foreign language publishing, and licensed product branding and development, reporting to Russell Brown, President of Consumer Products, Promotions, and Ad Sales. He will be expanding the company’s effort to reach new fans around the world through the book and mass markets, in addition to his publishing and operations duties. Stern first joined as Publishing and Operations Manager in early 2012 after earning a B.A. in English from Brooklyn College. Victoria McNally’s new duties will include working closely with Director of Marketing Mel Caylo to expand Valiant’s awareness and reach through innovative campaigns and initiatives. She will also work on developing new strategies for Valiant’s social media presence. McNally first joined the publisher in 2017 as Marketing & Communications Manager after working as an entertainment reporter at various press outlets, including MTV News, Bustle, Revelist, and Nerdist. She holds a B.A. in English from New York University. In Annie Rosa’s new role, she will continue working closely with comics retailers through one-on-one personal outreach and the creation of promotional items to help them and their staffs hand-sell Valiant product to their customers. Reporting to Vice President of Sales Atom! Freeman, she will also work to help increase Valiant’s penetration into the book and mass markets. In addition, Rosa will be instrumental in communicating with fans to actively work their comments into the company’s conversations. Rosa has been a member of the Valiant staff since 2017, starting as Sales Coordinator. Rosa holds a B.A. in English from Stonehill College and an M.A. in Publishing from Pace University. Valiant is currently preparing for HARBINGER WARS 2, a seismic, six-part crossover series and Valiant’s most impactful and ambitious comic book event to date, beginning on May 2nd with HARBINGER WARS 2 PRELUDE #1 by Academy Award-nominated writer Eric Heisserer (SECRET WEAPONS, Arrival) and astonishing artists Raúl Allén and Patricia Martín, and continuing on May 30th with HARBINGER WARS 2 #1 (of 4) by New York Times best-selling writer Matt Kindt (X-O MANOWAR) and blockbuster artist Tomás Giorello (X-O MANOWAR).